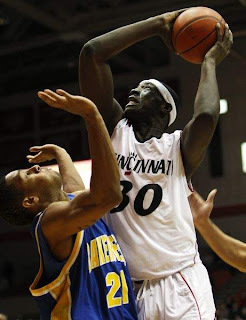 As expected, the Cincinnati Bearcats laid an 87-58 beating on the Roadrunners from Cal State Bakersfield. If you recall, I nearly predicted the final in the predictions post earlier. The Bearcats were lead by Dion Dixon's 13 and Biggie McClain had himself a game with 8 and 8. This was a take care of business and stay healthy game, and the Cats did just that. Full recap tomorrow.